(l-r) Levi Miller as Peter Pan and Garreth Hedlund as Hook in PAN. ©Warner Bros. Entertainment. CR: Lauire Sparham. 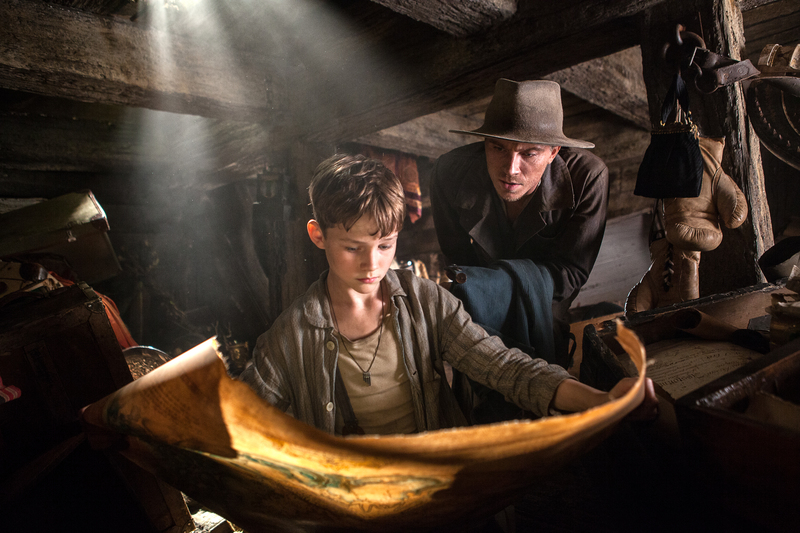 Audiences will discover how Peter Pan got to Neverland when “Pan” arrives on Blu-ray Combo Pack Tuesday Dec. 22, from Warner Bros. Home Entertainment. Directed by Joe Wright (“Atonement”), the live-action feature presents a wholly original adventure about the beginnings of the beloved characters created by J.M. Barrie. The film stars Oscar nominee Hugh Jackman (“Les Miserables”) as Blackbeard; Garrett Hedlund (“Inside Llewyn Davis”) as James Hook; Oscar nominee Rooney Mara (“The Girl with the Dragon Tattoo”) as Tiger Lily, Amanda Seyfried (“Les Miserables”) as Mary and newcomer Levi Miller as Peter. Extras on the Blu-ray Combo Pack include “Never Grow Up: The Legend of Pan,” an in-depth look at the expanded world of Barrie’s “Peter Pan,” “The Boy Who Would be Pan,” about how filmmakers found their perfect Peter, “The Scoundrels of Neverland,” the back story of Blackbeard’s fearsome reputation and how Hugh Jackman brought him to life, “Wondrous Realms,” an immersive adventure through Neverland as well as a director’s commentary. The family friendly feature is also available now on Digital HD. Twentieth Century Fox Home Entertainment and Europa Corp present nonstop action behind the wheel as “The Transporter: Refueled” is available on Blu-ray, DVD and Digital HD. From producer Luc Besson (“Taken” franchise) and director Camille Delamarre (“Brick Mansions”), this action-packed adventure picks up where the previous “Transporter” left off. Frank Martin (Ed Skrein, “Game of Thrones”) is the best driver money can buy, willing to deliver anything for a price. But when a gang of beautiful thieves kidnaps his father (Ray Stevenson), Frank must shift his skills into overdrive to rescue him. The Blu-ray comes loaded with special features including a special profile on Frank Martin and Ed Skrein’s transformation into a fighting machine, a featurette on the women of “The Transporter: Refueled” and a look at the Audi S8 and how the crew executed adrenaline-filled spins on the road. Sony Pictures Animation’s family-friendly animated comedy “Hotel Transylvania 2,” which grossed more than $430 million in theaters worldwide, debuts on Digital HD Tuesday, Dec. 22, just in time for holiday viewing and on Blu-ray 3D Combo Pack, Blu-ray Combo Pack and DVD on Jan. 12 from Sony Pictures Home Entertainment. The Hotel Transylvania sequel reunites “Drac’s Pack” of loveable characters, led by Vampa Drac (Adam Sandler, “Grown-Ups”) as they try to put Mavis (Selena Gomez, “Spring Breakers”) and Johnny’s (Andy Samberg, TV’s “Brooklyn Nine-Nine”) son Dennis through a monster-in-training boot camp to bring out his vampire side. But little do they know that Drac’s grumpy and very old school dad Vlad (comedy legend Mel Brooks) is about to pay the family a visit to the hotel. When Vlad finds out that his great-grandson is not a pure blood and humans are now welcome at Hotel Transylvania, it doesn’t take long for things to get batty. The box office hit also features the voices of Kevin James, David Spade, Steve Buscemi, Keegan-Michael Key, Molly Shannon and Fran Drescher. “Hotel Transylvania 2” marks the return of three-time Emmy winning director Genndy Tartakovsky (“Star Wars: Clone Wars”), along with producer Michelle Murdocca. The screenplay is by Adam Sandler and Robert Smigel (TV’s “Saturday Night Live”). The Blu-ray Combo Pack and DVD editions are full of extras, including Fifth Harmony’s “I’m in Love With a Monster” music video, a character sketch gallery, an inside look at how the filmmakers and animators created “Hotel Transylvania 2” and a director’s commentary. Exclusive to the Blu-ray are interactive featurettes on how to throw the ultimate monster party and draw your favorite characters from the film, a special Monster Scary-oke, which gives viewers the chance to sing along with Dennisovitch to spooky versions of three classic songs, must-see deleted scenes and more. Kristen Wiig (“The Martian”), Tunde Adebimpe (“Rachel Getting Married”) and Sebastian Silva star in the provocative drama “Nasty Baby,” available on DVD Tuesday, Dec. 22, from Sony Pictures Home Entertainment. Silva also wrote and directed the dramedy, which follows a trio of Brooklyn friends attempting to bring new life into the world until escalating tensions with a menacing neighbor force them into a situation where they may have to do the opposite. Co-starring Alia Shawkat (“The Final Girls”), “Nasty Baby” took home the Teddy Award (Best Feature Film) at the 2015 Berlin International Film Festival. Unbridled ambition, a ferocious storm, and the limits of human endurance collide at the top of the world in the white-knuckle adventure “Everest,” coming to Digital HD Tuesday Dec. 22, and 3D Blu-ray, Blu-ray, DVD and On Demand on Jan. 19, 2016, from Universal Pictures Home Entertainment. The action drama stars Jake Gyllenhaal (“Southpaw”), Keira Knightley (“The Imitation Game”), Jason Clarke (“Zero Dark Thirty”), Josh Brolin (“Sicario”), John Hawkes (“Winter’s Bone”), Robin Wright (“House of Cards”), Michael Kelly (“House of Cards”), Sam Worthington (“Avatar”) and Emily Watson (“The Theory of Everything”) in a thrilling and harrowing battle against the overwhelming power of nature. Following a pair of expeditions to the highest and most dangerous place on Earth, “Everest” captures the brutal majesty of the deadly peak, and the boundless courage required to conquer it, with breathtaking cinematography and spectacular storytelling. Exclusive extras include a behind-the-scenes look at the making-of the film, as well as insights about the real-life 1996 summit attempt that inspired it. Inspired by the incredible events surrounding an attempt to reach the summit of the world’s highest mountain, “Everest” documents the awe-inspiring journey of two different expeditions challenged beyond their limits by one of the fiercest snowstorms ever encountered by mankind. Their mettle tested by the harshest elements found on the planet, the climbers face nearly impossible obstacles as a lifelong obsession becomes a breathtaking struggle for survival. In a different sort of adventure, an international goodwill mission goes terrifyingly wrong in “The Green Inferno,” which is available on Digital HD Tuesday Dec. 22, and Blu-ray and DVD as well as On Demand on Jan. 5, from Universal Pictures Home Entertainment. New York college student Justine (Lorenza Izzo) meets student activist Alejandro (Ariel Levy) when he goes on a hunger strike on behalf of underpaid janitors. Smitten, she agrees to help Alejandro undertake his next project: rescuing an Amazon village from destruction by a greedy multinational corporation. But Justine soon comes to regret her decision when their plane crashes in the Peruvian jungle and the students realize they are not alone. No good deed goes unpunished as the tribe they came to save captures the well-meaning students and turn out to be cannibals. The feature film marks the return to classic cult horror by idiosyncratic director Eli Roth (“Cabin Fever,” “Hostel” films), since “Hostel: Part II.” “The Green Inferno” also stars Aaron Burns (“The Stranger”) and Kirby Bliss Blanton (“Project X”). The screenplay is by Eli Roth and Guillermo Amoedo (“Knock Knock”).